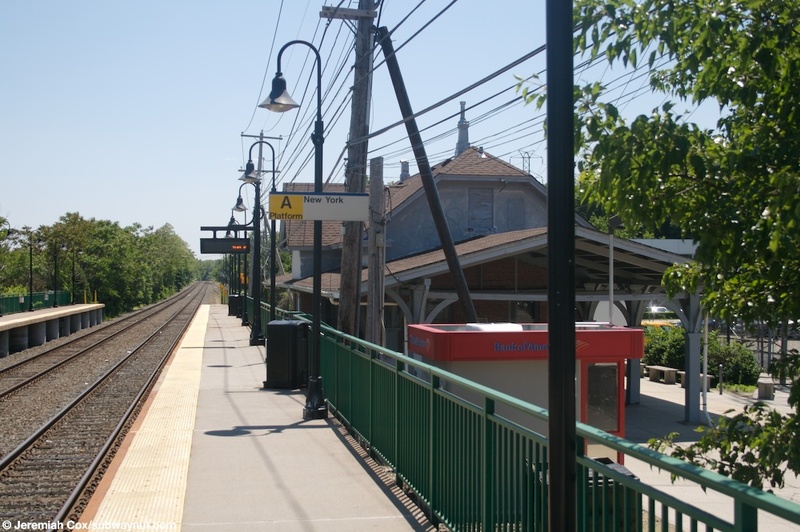 Roslyn has two 4 car side platforms for the two tracked line. 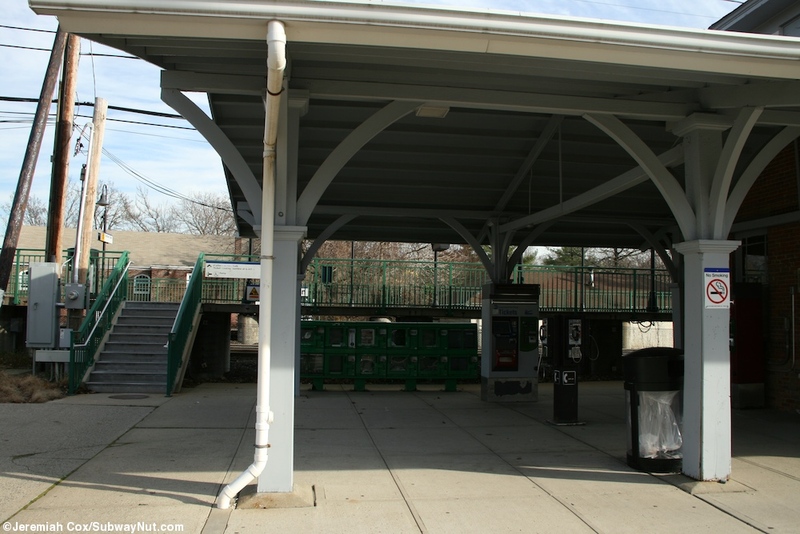 The two platforms themselves are of late 1990s origin and include green fencing and a line of black lampposts but no shelter for waiting passengers. 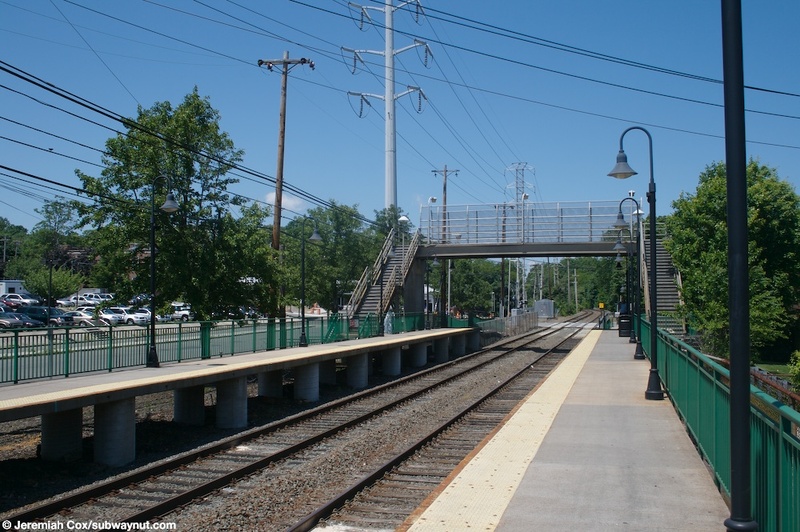 Access to Oyster Bay-bound platform is extremely simple with the main entrance via an overpass to the New York-bound platform with bare concrete and fencing typical of the late 1960s, including a white lamppost along each staircase up to the overpass. 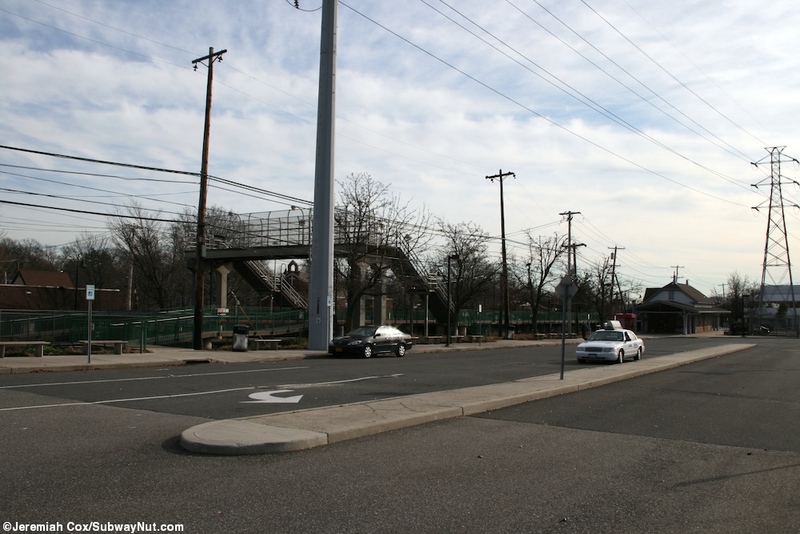 For ADA compliancy a ramp leads down to a short walkway to the grade crossing of Lincoln Avenue. 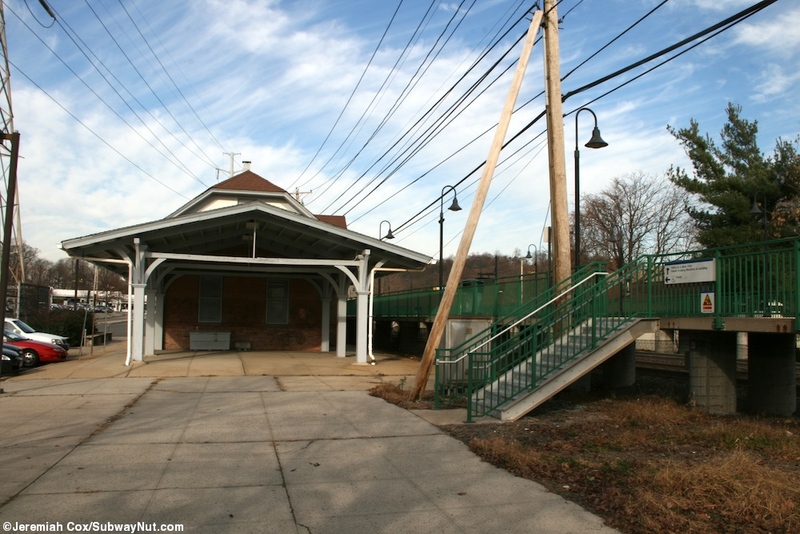 Along the New York-bound platform is where the main station amenities are with a large parking lot with numerous staircase and ramp access near the grade crossing as well and the overpass. 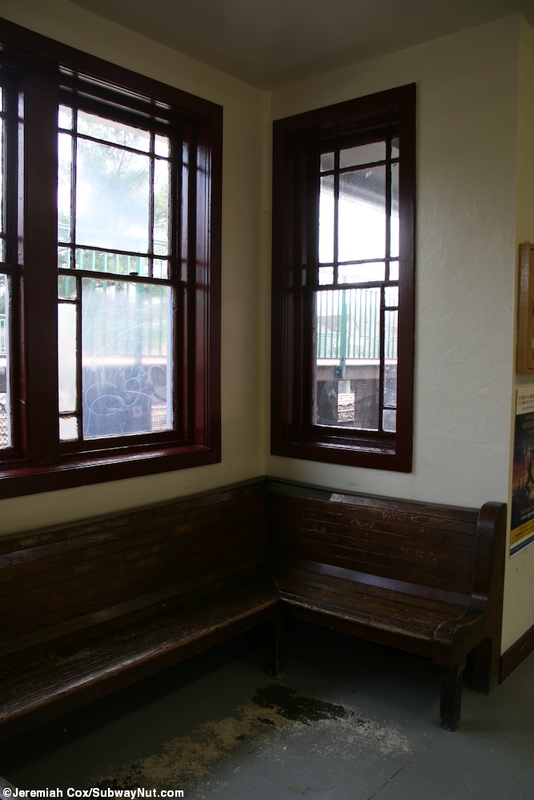 Just beyond the platform is the historic 1887 depot that was moved to its current location midway along the New York-bound platform in 1988 (Long Island Station History, Trains are fun). 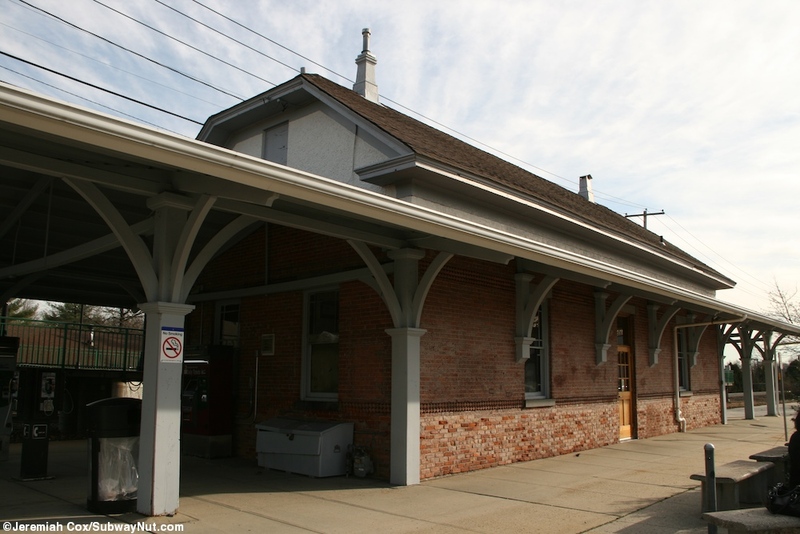 This depot has a complex double gabled roof and the top, where not shingled is painted white with blue trim. The rest is exposed masonry. 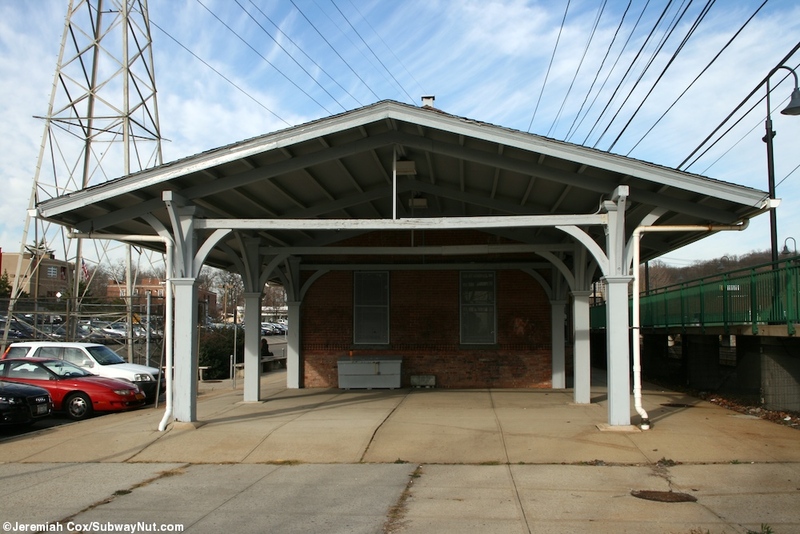 The roof extends for two canopied areas on either side of the building itself that were apparently designed for the unloading of horses before boarding trains. Today beneath these are the station's TVMs. They are held up by comluns painted a light grey. 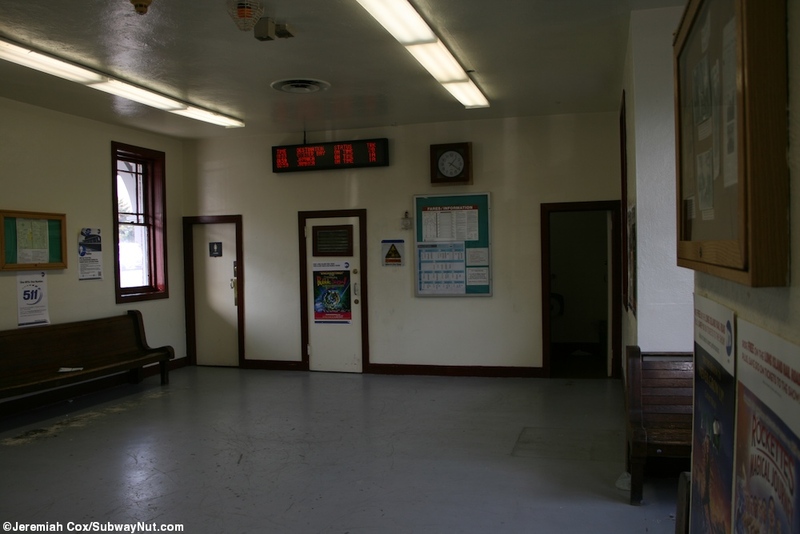 Inside the station is a decent sized waiting room with a few benches, restrooms and a sealed ticket window. 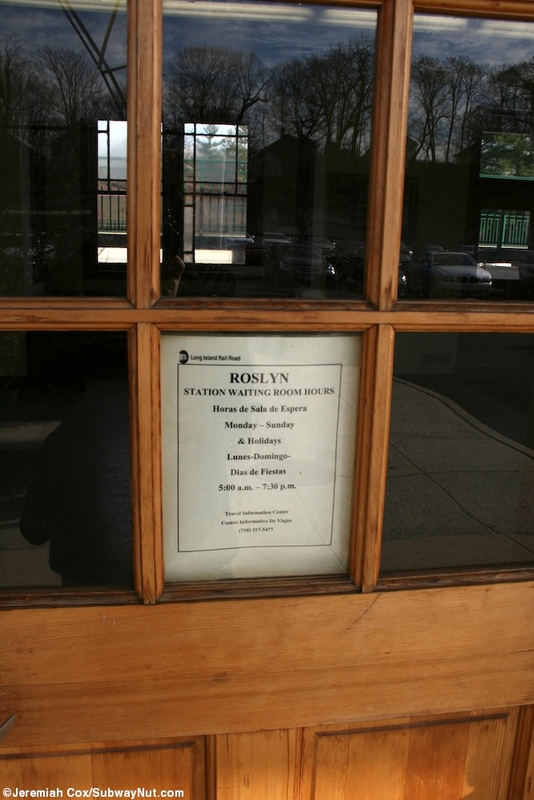 It is open daily from 5am to 7:30pm. 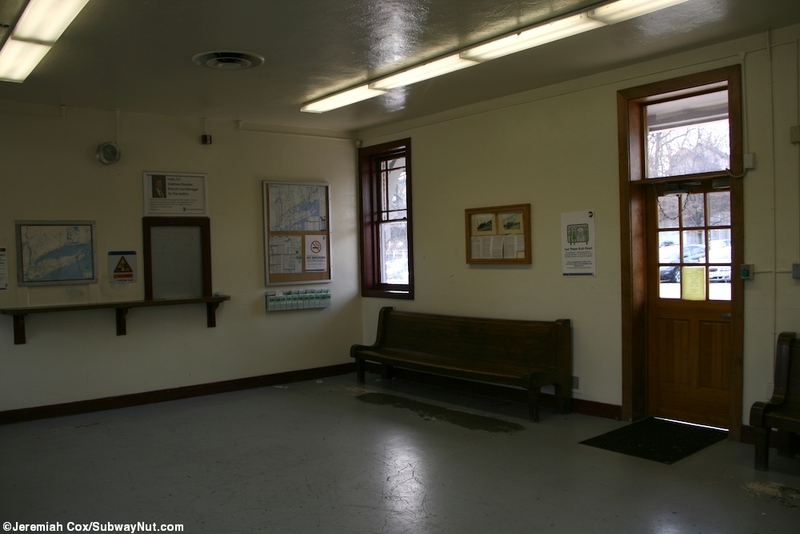 It had a ticket agent until November 20, 1996 (Phil Mintz. 'LIRR Machines Replace Vendors' Newsday November 7, 1996, A. 31). 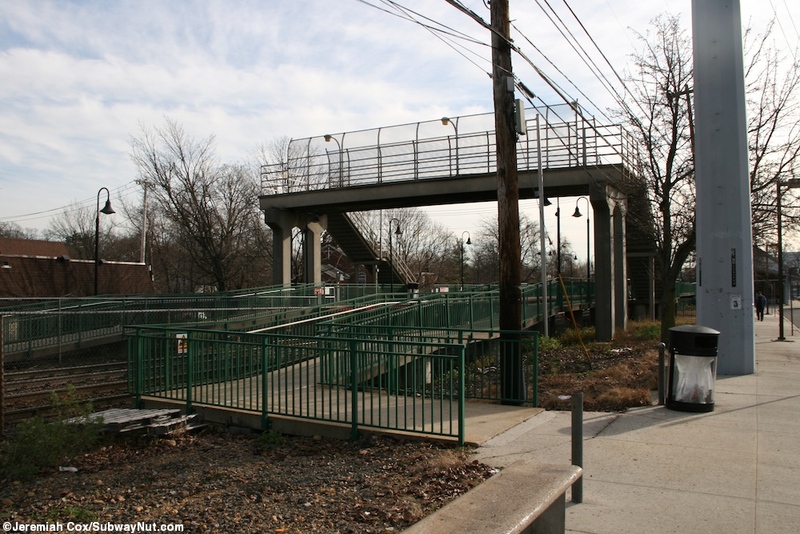 Looking down the New York platform at Roslyn, the narrow boring looking staircase up to the chain link fence overpass is viewable in this picture. 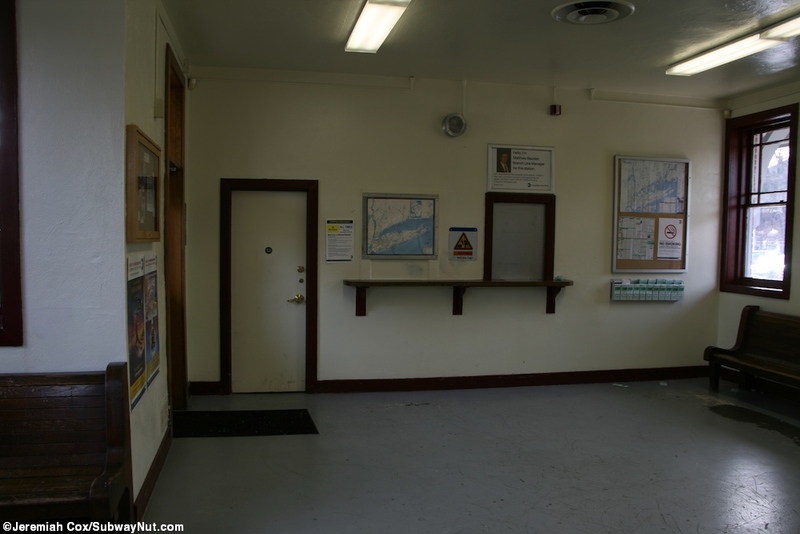 Looking down the New York platform at Roslyn with the now unused large station house visible, as well as a Bank of America ATM in a shelter along the parking lot. 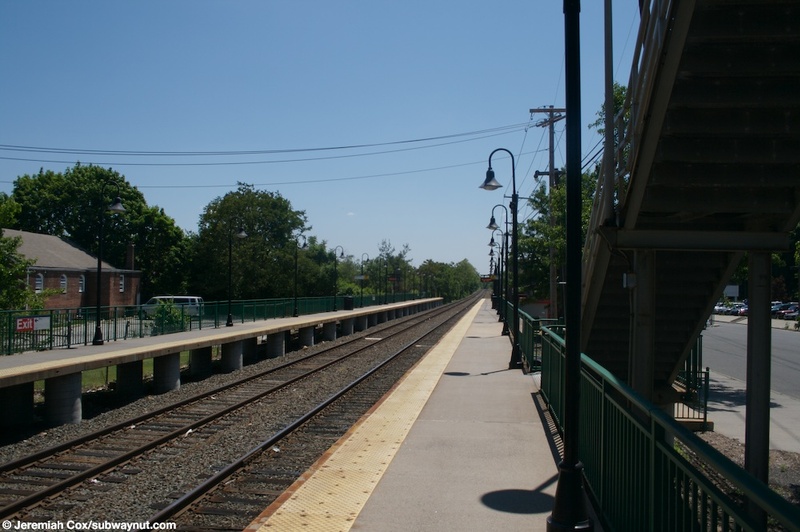 Looking down the Oyster Bay platform at Roslyn, the staircase up to the overpass between the tracks is visible. 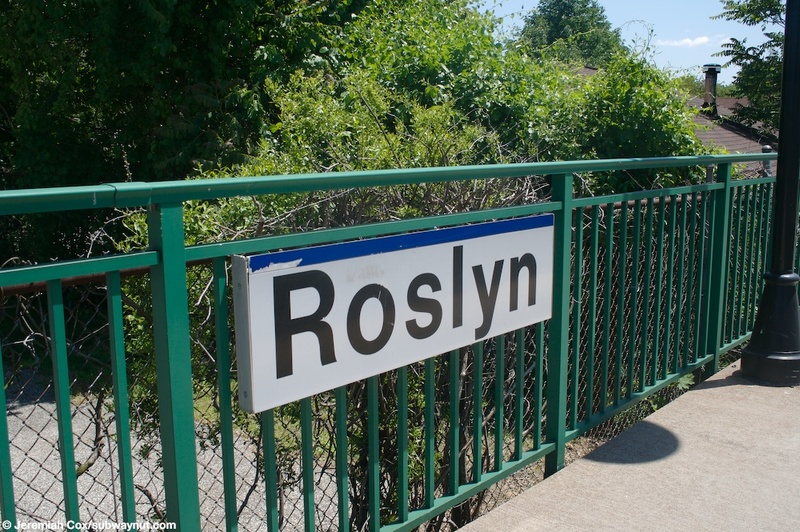 A platform sign along the boring green fence of the modern high-level platform at Roslyn. 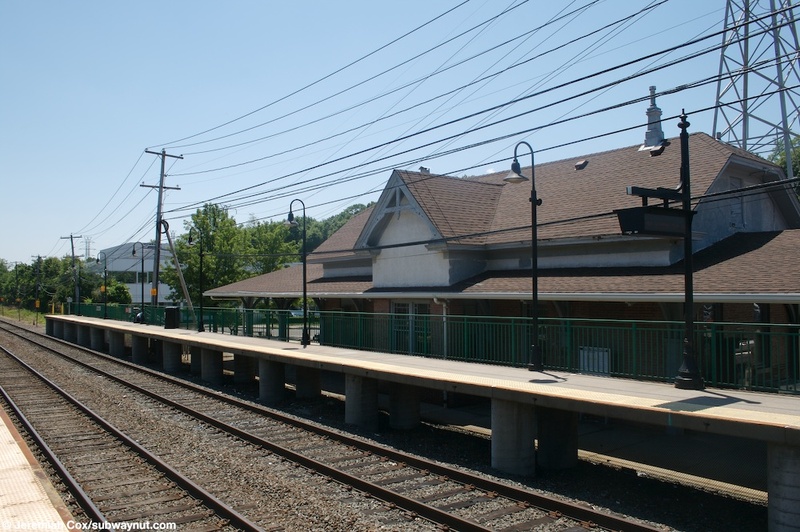 A view of the station house that along the Manhattan platform at Roslyn that looks quite low because of the quite (1990s) addition of the high level platform. 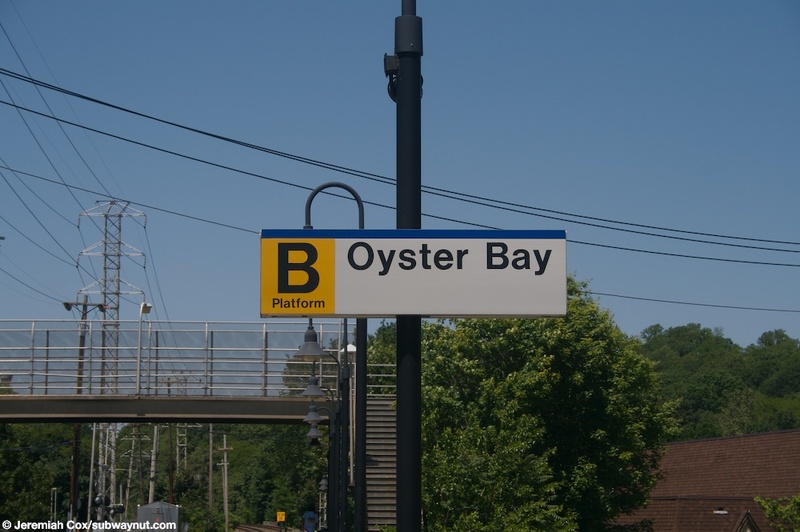 B platform Oyster Bay sing on a lamppost at Roslyn.. 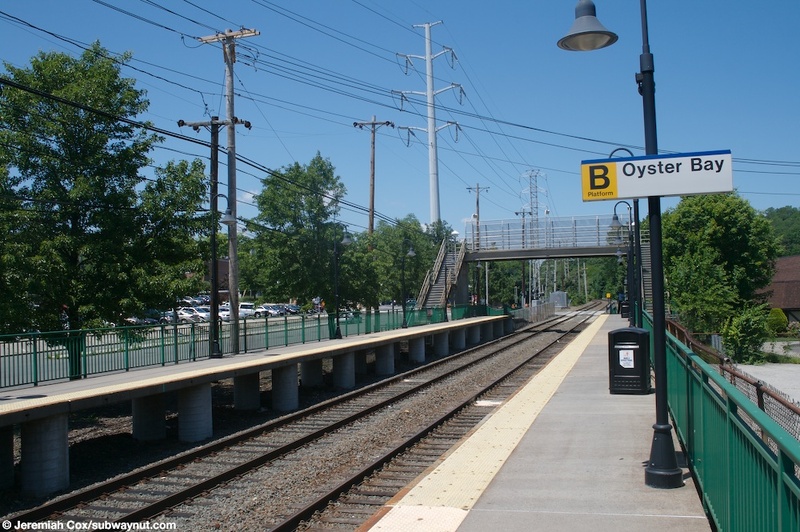 Looking down the Oyster Bay platform at Roslyn with the overpass across the tracks visible. 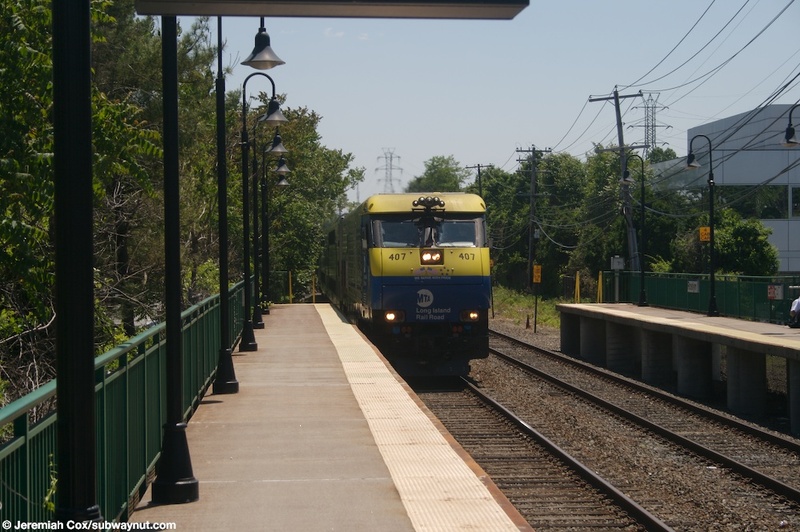 EMD GE30-AC Locomotive #409 pulls a three C3 coaches Oyster Bay train into Roslyn. 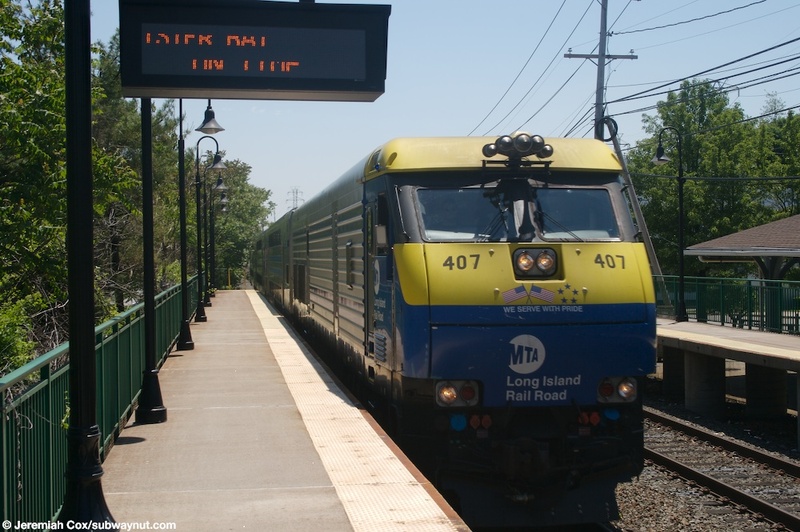 EMD GE30-AC Locomotive #409 enters Roslyn pulling a Oyster Bay train.